Node.js is enjoying much popularity and Glenn Block is helping us to bring it on Windows Azure. 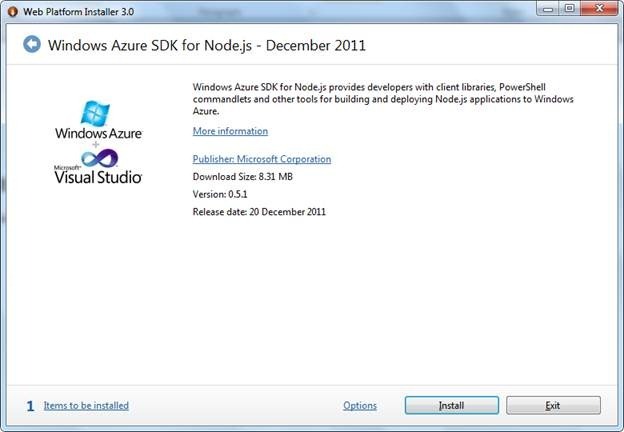 In this tutorial, I will walkthrough step by step to create your first Windows Azure Node.js Web Application. I have divided this tutorial in three parts as installing required SDK, creating Web Application and then publishing to Windows Azure portal. Purpose of this tutorial is to help you in setting up environment and publishing. In further tutorials we will dig deeper. After successful installation, you should get below confirmation dialog . By this step SDK has been installed on your machine. There are four files created. If you are coming from Windows Azure background, you must be aware of other three files than deploymentSettings.json file. deploymentSettings.json file stores local setting for Windows Azure PowerShell deployment cmdlets. Now if you list files created inside WebRoleForNodeJS , you will find configuration files and a JS file. Most important file is server.js. This file contains starter code for Node.JS. You need to add codes in this file. Go ahead and open this file in NotePad. As of now, I am leaving default code created by the tool. 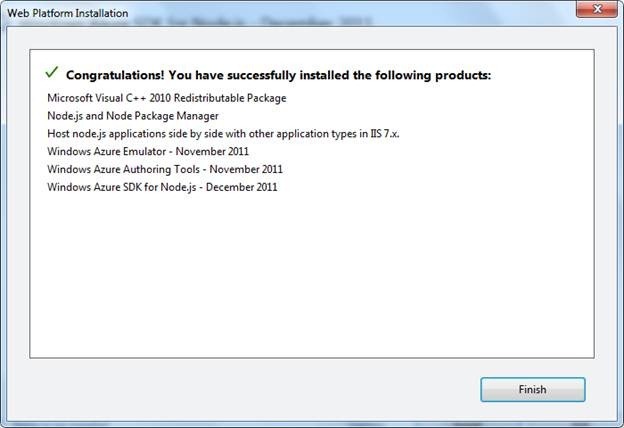 To run it locally, go ahead and execute below PS command to start Windows Azure Emulator. You will be redirected to live login page. Sign in to download Publish Setting file. After login you should able to download PublishSetting file. Download file inside Node folder you created in previous steps. Note : Publishsettings file only needs to be imported once on the machine to set it up. You do not need to do that each time you create a service. In above command name is the unique name and location is one of the Windows Azure Data center. 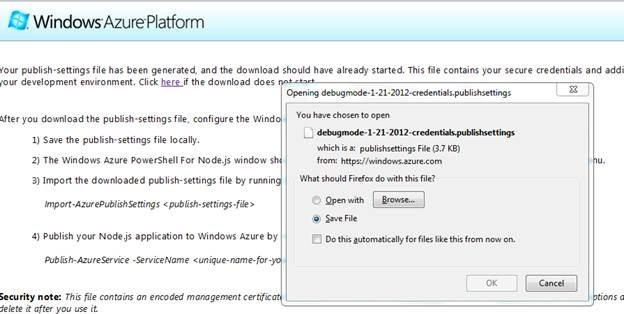 After successfully publish operation , you should able to see Node.js running on Windows Azure portal. Nice job Dhananjay! Just to clarify, the publishsettings file only needs to be imported once on the machine to set it up. You do not need to do that each time you create a service. Thanks for coming on my blog. I have updated blog with information given by you. Yes, very simple and up to the point post to get going with Node on Azure. Good work.